Text: Origins. The English hymn “O mother, dear Jerusalem” and its relatives and variants come from a Latin text, “Mater Hierusalem, civitas sancta Dei,” otherwise known as Chapter XXV in the spuriously named Meditations of St. Augustine. The texts in that collection are not by Augustine. The Meditations have their roots in an 11th century collection held at the Bibliothèque Municipale of Metz, MS 245. This MS does not contain the name of Augustine; rather, it is signed by Johannes, who is almost certainly Jean, the abbot of Fécamp (ca. 990–1078). The work was intended for Agnes, widow of Henry III of Germany. It can be divided into two parts, the first of which was copied and transmitted under the name Liber Supputationum, and attributed to Augustine by the end of the 12th century. The second part became known as the Confessio Theologica. By the end of the 14th century, the Liber Supputationum was combined with works attributed to Anselm of Canterbury (ca. 1033-1109) and was renamed the Meditationes Divi Augustini Episcopi Hipponensis (Fig. 1). One useful English translation can be found in The Meditations, Soliloquia, and Manuall of the Glorious Doctour S. Augustine (Paris: Nicolas de la Coste, 1631: PDF), pp. 87-92. For a more detailed account of the origins and development of this text, see the meticulous study by Stephen A. Hurlbut, The Picture of the Heavenly Jerusalem (Washington, D.C.: St. Albans Press, 1943: PDF). For a side-by-side comparison of the Latin, the 1631 English translation, and the hymns “O mother, dear Jerusalem,” and “Jerusalem, my happy home,” see this PDF. Text: Translation. “O mother, dear Jerusalem” is a metrical translation and paraphrase of Chapter XXV of the Meditations, including the first few lines of Chapter XXVII. (Note: In the earliest manuscripts, these two followed one another; Chapter XXVI, the hymn by Damiani, was a later insertion.) This metrical paraphrase was first published in The Glasse of vaine-glorie: Faithfully translated (out of S. Avgvstine his booke), by W.P. Doctor of the Lawes (London: Iohn Windet, 1585 | Fig. 2 | PDF). Nothing is known about the author, W. Prid, or William Prid, except the credentials named in the title. Fig. 1. Divi Avrelii Avgvstini Hipponensis Episcopi, Meditationes, Soliloquia & Manuale (Baltazaris Belleri, 1619), p. 66. Fig. 2. The Glasse of vaine-glorie (1585), p. 64. Fig. 3. The New Jerusalem: A Hymn of the Olden Time (1852). Text: Adaptation and Development. The second English text is much less a translation from the Latin than it is an adaptation inspired by the same ideas. The oldest known copy of “Jerusalem, my happy home” is in a British Library manuscript (Add. 15225). For a full transcription, see The New Jerusalem: A Hymn of the Olden Time, edited by Horatius Bonar (Edinburgh: Johnstone & Hunter, 1852: PDF | Fig. 3). 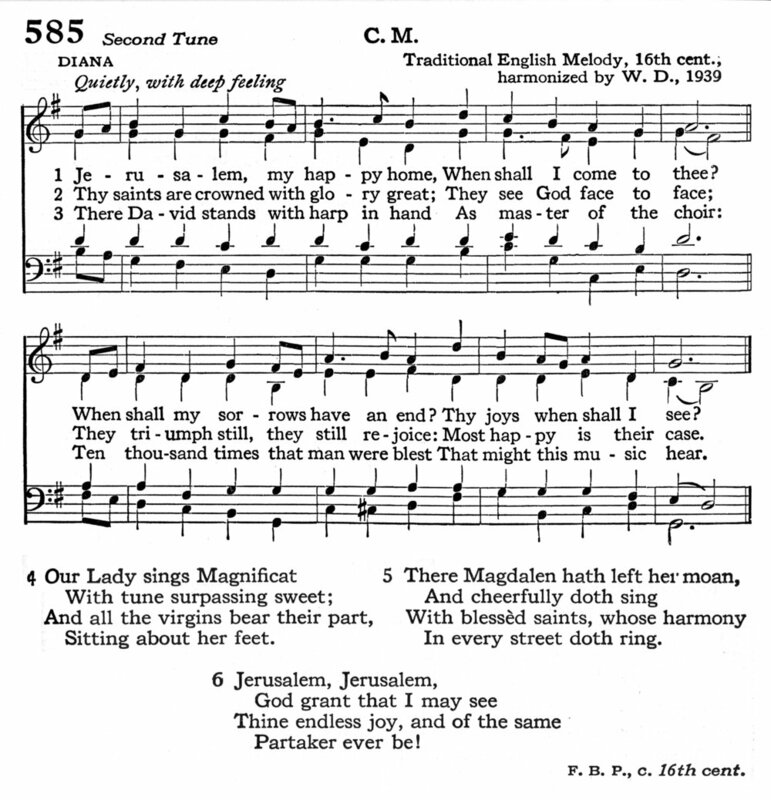 “Jerusalem, my happy home” was written during the reign of Elizabeth I, probably after 1571 and before a variation of the text appeared in print in The Song of Mary the Mother of Christ . . . with the Description of Heauenly Ierusalem (London: E. Allde, 1601). The British Library manuscript, dated by some scholars to ca. 1593, is attributed to “F.B.P.” Owing to some unsubstantiated guesswork by nineteenth century scholar Daniel Sedgwick, the hymn has been credited in some printings to “Francis Baker, Priest,” but the true author is unknown. The preface to Bonar’s edition mentions the erroneous attribution of this text to David Dickson (1583-1663), a Scottish Presbyterian minister. His name, for example, appeared in the earliest hymnal printing of MATERNA (see Tune 1 below). With this text and “O mother, dear Jerusalem” being in common meter, and both containing similar themes, stanzas from these two texts have often been intertwined. Another text beginning “Jerusalem, my happy home,” but containing new stanzas, appeared in a small collection of hymns printed by James Montgomery for the Eckington Parish Church Choir, ca. 1796-1800, otherwise known as the Eckington Collection. This version was repeated in A Collection of Above Six Hundred Hymns, edited by Rev. Edward Williams and Rev. James Boden (Doncaster: D. Boys, 1801 | PDF), and included in Montgomery’s Psalms and Hymns for Public or Private Devotion (Sheffield, 1802: PDF) and his Christian Psalmist (Glasgow: Chalmers & Collins, 1825 | PDF). The “Bromehead” version cited in some sources and hymnals is from Joseph Bromehead's Psalms and Hymns, for Publick or Private Devotion (Sheffield, 1795 | WorldCat). One other version of “Jerusalem, my happy home” of some importance was published in A Collection of Sacred Ballads, edited by Richard and Andrew Broaddus (1790), introducing a new stanza, beginning “When we’ve been there ten thousand years.” This additional stanza was eventually appended to another hymn, “Amazing grace,” in Edwin Excell's Coronation Hymns (1910). Tune 1. MATERNA, by Samuel A. Ward (1848-1903), was written for and draws its name from the hymn “O mother, dear Jerusalem.” It was first published in The Parish Choir, vol. VIII, no. 378 (July 12, 1888 | Fig. 4). This first printing did not offer a tune name, except the numerical “Hymn Tune 27.” The text is a mixture of stanzas from W. Prid and F.B.P. The first appearance of MATERNA in a hymnal was in The Church Hymnal, edited by Charles Hutchins (Boston, 1894 | Fig. 5). In this printing, the tune name had been applied, and the authorship of the text was credited erroneously to David Dickson. In the United States, this tune is more closely associated with the poem “O beautiful for spacious skies” (“America the Beautiful”) by Katharine Lee Bates (1859-1929). Fig. 4. MATERNA in The Parish Choir, vol. VIII, no. 378 (July 12, 1888), p. 1510. Fig. 5. MATERNA in The Church Hymnal, ed. Charles Hutchins (1894). Fig. 6. The Hymnal 1940 (NY, 1943). Tune 2. The British Library manuscript mentioned above (Text: Adaptation) bears the attribution “A song by F.B.P. to the tune of Diana,” which probably refers to the English folksong “Diana and her darlings deare.” The earliest known printing of this song is in A Handefull of Pleasant Delites, by Clement Robinson and others (London: Richard Ihones, 1584: PDF), text only, where the suggested tune is QUARTER BRAULES. No copies of this tune could be found, but the meter of this 1584 text does not match the common meter of “Jerusalem, My Happy Home,” so it seems unlikely that one could be sung to the tune of other. The editors of The Hymnal 1940 Companion (3rd rev. ed., 1962), pp. 343-344, claimed that the tune DIANA was identical to the English ballad tune ROGERO, which dates as early as 1557, therefore The Hymnal 1940 (NY: Church Pension Fund, 1943) paired “Jerusalem, my happy home” with ROGERO but called it DIANA (Fig. 6). This claim seems to have originally come from Hyder Edward Rollins, who in a letter to the London Times Literary Supplement (22 Dec. 1921), described finding a copy of the “Diana” ballad ca. 1605-1640 in the Manchester Free Library, set to ROGERO. William T. Brooke, “Jerusalem, my happy home,” A Dictionary of Hymnology, ed. John Julian (London: John Murray, 1892 | Google Books), pp. 580-583. Stephen A. Hurlbut, The Picture of the Heavenly Jerusalem (Washington, D.C.: St. Albans Press, 1943: PDF). “Jerusalem, my happy home,” The Hymnal 1940 Companion, 3rd rev. ed. (NY: Church Pension Fund, 1956 | WorldCat), pp. 341-343. “Rogero,” The Ballad Literature and Popular Music of the Olden Time, edited by William Chappell, Vol. 1 (London: Chappell & Co., ca. 1855 | PDF), pp. 93-95.